I don’t know about you, but for the stocks I own, the stocks I follow and ones I have seen from updates throughout the industry, this has been an earnings season full of land mines. Stocks have been plunging left and right on bad earnings reports. It makes sense to see a stock go down on poor earnings, but the magnitude of the plunges is worse than normal. Tesla Inc. (Nasdaq: TSLA) shares dropped 6.8%. Advanced Micro Devices Inc. (Nasdaq: AMD) plunged 13%. And Under Armour Inc. (NYSE: UAA) sunk 23% on earnings, to name a few. The blue bars are this quarter, and the gray bars are the five-year average. Last earnings season, it was all about not rewarding companies that beat earnings expectations. Well, those are still underperforming, as you can see on the left side of the chart. But now the negative earnings announcements are being punished more severely. This could be a sign a correction is imminent. 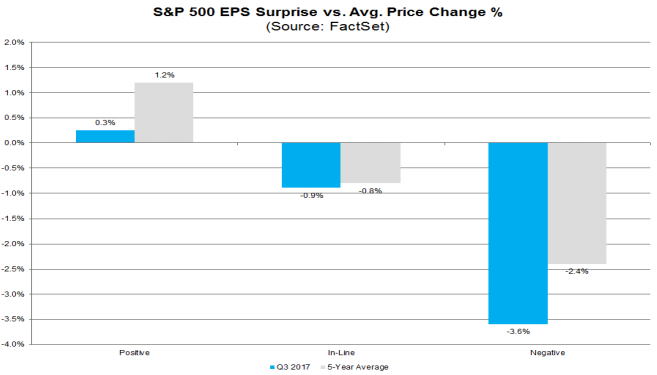 The negative sentiment on the market’s historic run without a correction is weighing on stocks reporting earnings over the past two quarters. We need to see a correction to get back to a normalized earnings environment. Until then, we can continue to expect these abnormal earnings seasons.